The TS-328 3-Bay NAS Enclosure from QNAP is their first NAS with only three drive bays, which allows users to build a RAID 5 array with the fewest possible hard drives, while also helping to ensure improved data protection, system performance, and greater available storage space, since only one drive is used for RAID 5's data redundancy. The TS-328 features a minimalist design that fits into your home or commercial space and with a variety of multimedia applications, 10-bit H.264/H.265 hardware decoding and transcoding, and cross-device file backup and synchronization, the TS-328 provides a highly cost-effective solution for storage, backup, file management, and sharing. Network connectivity is achieved using two Gigabit Ethernet ports. When both ports are used simultaneously, read speeds can reach 225 MB/s, while write speeds max out at 155 MB/s. Encrypted transfers deliver read speeds of up to 222 MB/s and write speeds of up to 146 MB/s. This 3-bay enclosure natively supports 3.5" SATA III hard drives, and 2.5" hard drives and SSDs are also supported using 2.5" drive trays. Using the two 5 Gb/s USB 3.0 Type-A ports and one 480 Mb/s USB 2.0 Type-A ports, this QNAP NAS can be connected to other devices, allowing you to easily transfer large media files via USB. Additionally, the TS-328 is validated with FIPS 140-2 AES 256-bit encryption, helping to prevent sensitive business data from unauthorized access and breaches. In addition to RAID 5 compatibility, QNAP has engineered this NAS to also support RAID 0 and 1, and each of the three RAID modes offer data redundancy, performance, or a combination of both. For those who do not require a RAID, JBOD and single disk modes are also available. 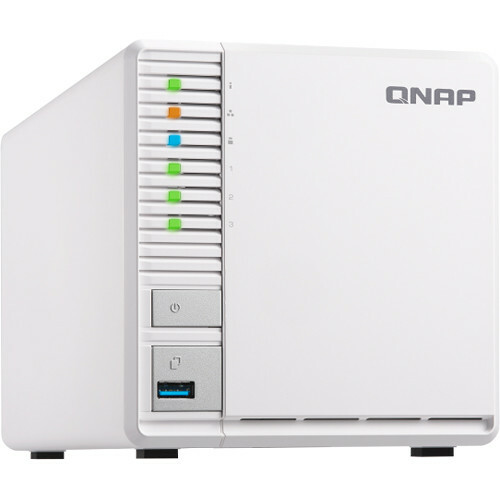 QNAP's TS-328 3-Bay NAS Enclosure operates using an included 65W AC adapter that runs using 100-240V. Also included is a power cord, an Ethernet cable, and a 2.5" HDD/SSD drive base tray. Protection is provided by a limited 2-year warranty. You may have lots of photos or videos spread across devices, which can be hard to manage and back up. With the TS-328, you can centrally backup and manage all your files and easily share them with others. With this version of File Station (QTS 4.3.4), you can directly access the photos and videos on your mobile device by connecting it to the TS-328 via USB. You can even use the Qphoto mobile app to take photos or record videos and directly upload them to the TS-328 for greater protection to save the storage space on the mobile device. The TS-328 is powered by a 1.4 GHz Realtek RTD1296 Quad-Core processor with 2GB of DDR4 memory. It provides two 1GbE ports and SATA III 6 Gb/s drive bays, delivering up to 225 MB/s read/write speeds. The TS-328 also has two USB 3.0 Type-A ports and one USB 2.0 Type-A port, allowing you to easily transfer large media files across devices via USB connection. Snapshots help protect your data by fully recording the NAS system state and the metadata. If an error occurs, you can use snapshots to quickly restore the system to its normal state. QNAP snapshots are block-based and only record the changed data. Not only does this save storage space, but it also reduces the time required to back up and restore data. The TS-328 supports 4K H.264/H.265 hardware decoding and real-time transcoding, allowing you to convert videos to universal file formats that can be smoothly played on multiple devices. Therefore, you can easily share movies or travel videos saved on your NAS to your family and friends via shared links and they can enjoy watching the videos. Note: The TS-328's hardware provides H.264/H.265 10-bit hardware decoding, encoding, and transcoding capabilities. However, the playback quality may vary due to factors including playback software, file formats, system usage, and available bandwidth. The TS-328 also reserves some RAM for use as shared graphics memory. The TS-328 supports SSD caching to greatly boost the IOPS performance of storage volumes and increase operational efficiency. It is good for improving the overall workflow of IOPS-demanding applications and allows the best of both cost and performance by combining SSDs with HDDs. Note: All the drives bays of the TS-328 support SSD caching. The TS-328 comes with one 2.5" HDD/SSD drive tray base. You can purchase additional drive tray bases from QNAP shop. QNAP provides a wide range of multimedia applications for you to enjoy photos, music, or videos. QVHelper allows users to stream media files or music playlists from a QNAP NAS to VLC player and Qmedia allows music, photos, and videos to be streamed to Android televisions or set-top boxes. ideo HD is free KODI add-on that combines KODI's streaming and video decoding capabilities and fully supports Video Station's features. The app-driven QTS operating system provides solutions for simplifying file backup, management, search, and more. With File Station, you can view your NAS files and access files from USB storage devices, the OCR Converter allows you to extract text from images, Qfiling helps automate file organization, and Qsirch helps quickly find files. Use File Station to directly access files on USB devices, including optical disc drives. Files from USB devices can be easily backed up to the TS-328. Qsirch supports keyword search for finding images, music, videos, documents, and emails, making it easier to locate files. The TS-328 sports a stylish, elegant look with an industrial design concept to provide better cooling for the NAS. The toolless 3.5" hard drive installation allows easier system setup and maintenance, while the front-panel LEDs assist in viewing the system status. With integrated data backup, restore, and synchronization, Hybrid Backup Sync helps you easily backup or synchronize data on the TS-328 to other QNAP NAS devices, USB storage (one touch copy), or cloud storage. With Qsync, you can also access your NAS files from desktops, laptops, or mobile devices connected with the TS-328 at any time. Container Station integrates LXC and Docker lightweight virtualization technologies. You can download apps from the built-in Docker Hub to easily import/export container apps and manage access controls, enjoying the benefit of easy installation, transferability, and high efficiency. Box Dimensions (LxWxH) 11.5 x 10.3 x 6.6"